Curry powder lends a lot of flavor and a touch of heat to these vibrant sweet potato latkes. They’re great with homemade applesauce and sour cream, though it’s even more fun to take a cue from their Indian inspiration and serve them with mango chutney and cucumber mint raita. Gather the ingredients. Preheat the oven to 200 F.
Place the grated sweet potatoes in a large bowl. In another bowl, whisk together the flour, curry powder, baking soda, and salt. Add the flour mixture to the sweet potatoes and toss together to coat. Add the eggs and coconut milk to the sweet potato mixture and thoroughly combine. Add 1/4-inch of oil to a large, heavy skillet. Heat over medium-high heat until the oil is shimmering, but not smoking. 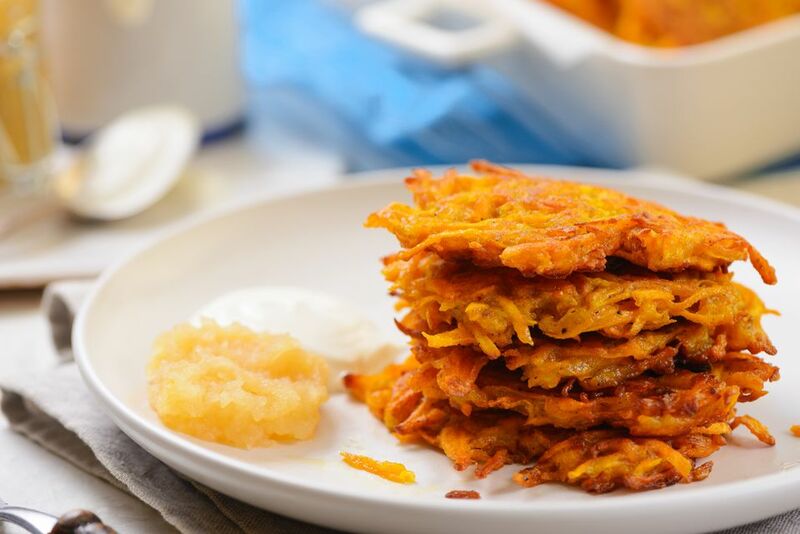 Test the temperature by dropping a few sweet potato shreds into the oil—if it sizzles, it is warm enough to begin frying latkes. Drop the latke batter into the hot oil by the heaping tablespoonful and flatten each slightly with the back of the spoon. Take care not to crowd the pan. Depending on the size of your skillet, you’ll probably be able to fry 4 or 5 latkes at a time. Fry the latkes on the first side for 2 to 3 minutes, or until the undersides are golden brown. Flip the latkes and fry for 2 to 3 minutes more. If the latkes are browning too quickly, lower the heat slightly. Transfer the latkes to a paper towel-lined plate to drain, then place on the baking sheet and keep warm in the oven while you fry the rest of the latkes. Serve immediately with applesauce and/or sour cream or raita. Enjoy!